Are you a part of an off road club? 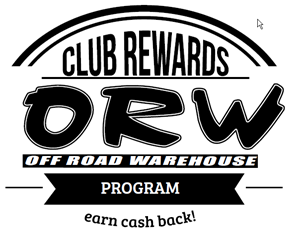 If so, you need to join our Off Road Clubs Reward Program and start earning cash back for your purchases with Off Road Warehouse. When you sign up, your club will be registered on our system where we will then be able to track your purchases, earning the club cash rewards! All your members have to do is present their rewards card, which we provide, or identify the club at the point of purchase, and then start racking up those rewards dollars. You can use your rewards bucks to fund your next event, order club shirts, donate to your favorite charity, or any other way you can think of! Visit the link below or visit us in person and we will get you all signed up.